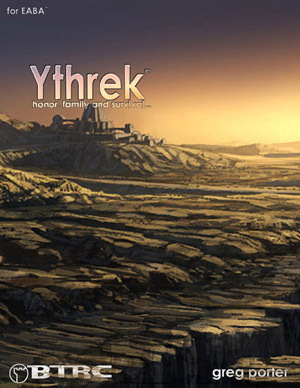 Ythrek is a resource-poor Renaissance world with magic, honor and a very harsh climate based on several overlapping cycles that go from searing to freezing as the decades pass. It has been eight hundred years since the Cataclysm that nearly tore the world asunder. So few survived that even the nature of the disaster is unknown. But, from the accounts of the Spirits and the survivors, and tales brought by traders, things thought dead but only sleeping have begun to awaken. The spring decade is upon the people of Novomad, center of Ythrek's civilization (at least they think so). The weather once again permits travel to lands out of touch since the start of the long winter years, and the squabbling scions of the Six Families once again seek fame, fortune and Ancient knowledge in the wastes outside Novomad's fertile valleys. Ythrek is 76 pages long and includes everything you need to dive into this quasi-fantasy world, including 2 short adventures to give you a head-start into the Byzantine politics all Ythrek adventurers will have to deal with in addition to the regular hazards of adventuring life.